If you like festivals you're in luck, all over Australia they are held, and one state, South Australia, even calls itself the Festival State. Summer is peak time for festivals in the south. Tell us about festivals that you know of to add to this page! Cooktown Festival - Every year in june the town of Cooktown has a long weekend of festivities that starts with the re-enactment of the landing of James Cook in Cooktown in 1770 in which they beached their damaged ship and spent seven weeks around the area repairing it, in the process also discovering the kangaroo. Good festival to visit if you like to see some history and lots of drunk cowboys, bring your own tent or book your accommodation well in advance. Festival Cairns - Runs for most of September each year. Cairns Show – The Cairns Show happens mid June and is reason for a public holiday that will shut half the city down. Cairns show is the largest agricultural show in regional Australia and also has an associated wine show with a special section for “Tropical Fruit Wines”. Port Douglas Carnival – Held in May each year, it now has become a shire wide festival with activities north of the river up to Cape Tribulation. Wallaby Creek Festival - In September the Cape York Folk Club organizes this festival at Home Rule in Rossville, about 30 km. south of Cooktown. Yungaburrafolkfestival - Held in October, Yungaburra is located in the Atherton Tablelands to the west of Cairns. Nimbin's Mardi Grass - The 12th Annual Nimbin "Let It Grow!" Mardi Grass 2004 will be held on 1 and 2 May, together with the Hemp Olympics and the Nimbin Cannabis Cup will be raced around that time too. The now-legendary HEMP Olympix comprises pothead contests around joint rolling, bong throwing and, for the more physically-minded, a Growers Ironperson competition. For this contestants pit themselves against the odds in outlandish tests of strength such as crawling through lantana tunnels dragging large bags of fertiliser. Based (very loosely) on the Amsterdam event of the same name, the Nimbin Cannabis Cup is a nice mellow wrap-up to the heightened chaos of the previous few days. A rather broad selection of the best local buds is tasted, toked and tested by a smattering of card-carrying "expert" judges, eventually choosing a winner. If you don't make it as a judge however it doesn't really matter. Just like in Amsterdam, there's so much good pot everywhere that anyone that does make it to judge status is usually too stoned to tell anyway. Chinese Newyear - end January or early February this goes off with a bang (quite a few bangs actually) of Chineses fireworks in Sydney's Chinatown. City to Surf Run - in Sydney tens of thousands of people run the 14 km. from Hyde Park to Bondi Beach on the second Sunday in August. Kings Cross Carnivale - held in 'the Cross' at the end of October or early November. Manly Jazz Festival - lots of jazz music happens in Manly early October on the Labour Day long weekend. Royal Easter Show - a 12 day agricultural show held at Sydney's Homebush Bay, great fun for the kids. Sydney Festival - held in January, art and free outdoor concerts. Sydney Film Festival - held in June at various cinemas around town. Sydney Fringe Festival - also held in January, lots of arts around the Bondi pavilion. Sydney to Hobart yacht race - starts in Sydney on 26 December and runs for 630 nautical miles, roundabout 1200 km., to the Tasmanian capital Hobart. The start is always spectacular and risky as hundreds of other boats steam along to farewell the racing yachts resulting in many near misses or the occasional collision. Tamworth Country Music Festival - The Nashville, Tenessee of Australia, if you like country music this is the place to go. Chinese Newyear - you haven't seen Newyears celebrations until you've been to Melbourne's Chinatown to see how the Chinese do it. International Comedy Festival - held every April in Melbourne. International Film Festival - starts in July. Lygon St. Festa - an Italian festival held in November in Carlton, lots of food and music and a waiters race. Melbourne Cup - first Tuesday in November, this is a major event that stops the whole country, see the annual events for more info. Melbourne Food and Wine Festival - lots of eating and drinking to be done the last two weeks in March. Melbourne International Festival - this kicks off in October and actually includes several festivals with the cream of arts, music and a big streetparty on Brunswick Street. Melbourne Music Festival - loads of music every February. Midsumma Festival - gay and lesbian festival from late January to early February, not a bad party but no match for Sydney's Mardi Gras. Moomba - a ten day festival in early March, very big and lively. Jazz Festival - held every January, a must for jazz music fans. Queer Film and Video Festival - films and videos produced by gay artists. 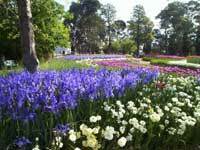 Royal Melbourne Show - held in September at the showgrounds in Flemington. St. Kilda Festival - a whole week of arts, culture and food every february. St. Kilda FIlm Festival - Australian made films and videos, held every May. 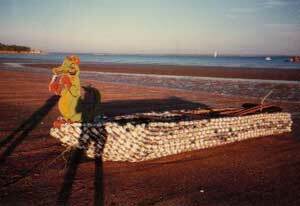 Beer Can Regatta - usually held in July / August , has diversified into lots of games and watersports but originally used to be a day of serious drinking and racing the boats made out of beercans. Darwin to Bali yacht race - this used to be the Darwin to Ambon race but due to security concerns this has been changed. Some serious drinking and partying happens at the Darwin Sailing Club in the months leading up to the race that kicks off late July/early August. Many round the world sailors join this race so if you;re looking for a boat to crew on this is a good place to look. Darwin Cup Carnival - Territorians love their horse racing and every year this event is held through July and August at the Fannie Bay race track. Greek Glenti Festival - Darwin has a sizeable Greek population and once a year they celebrate their festival on the Esplanade with lots of good food and drinks. Humpty Doo Darwin Stubby Drinking Competition - not sure if this is still held either, contestants have to drink a Darwin Stubby, a beerbottle of two litres, as fast as they can in the town of Humpty Doo, on the highway on the way to Kakadu. Rodeo and Country Music Concert - Every year in August. Royal Darwin Show - Every July at the showgrounds in Winnellie. 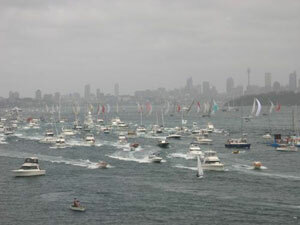 Sydney to Hobart Yacht Race - Every year on Boxing Day a group of sailing boats depart Sydney in a chaotic situation of hundreds of spectator boats all trying to get a good view to make it to Hobart in as little time as possible. Some serious partying goes on at the Hobart waterfront around this time. Hobart Summer Festival - runs from late December to late January, incorporating the above yacht race. Royal Hobart Regatta - This is the largest boating event in the southern hemisphere and is held in February. Salamanca Writers Weekend - Held in March. Perth Royal Show - every city or town of any size around Australia has an annual Royal Show. We still have to add some more events here, don't think Perth is boring and this was the only one! Adelaidefestival.com.au - held in march. WOMAD - World of Arts Music And Dance, held in several places around the world but here it is called Womadelaide, it is held during March. 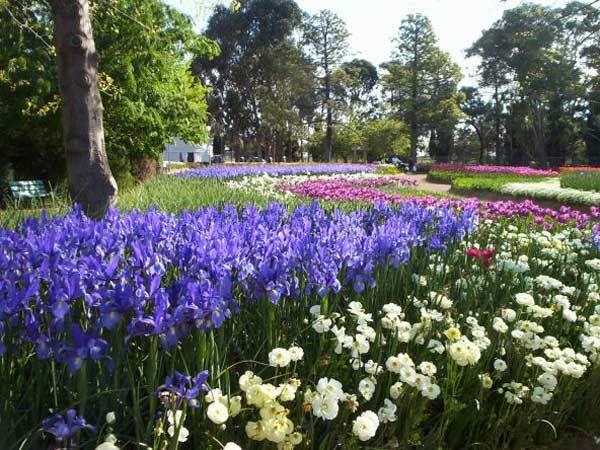 Floriade - Australia's Celebration of Spring, is a 30-day floral extravaganza. The festival of flowers and fun is complemented by entertainment and events right throughout the nation's capital. Usually run end September/early October. Do you know of (or organize ) any amazing Australian festival? Then contact us!